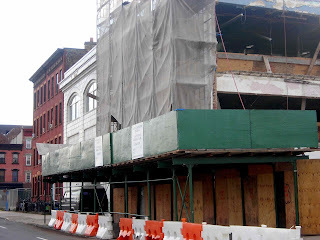 Just for the record, the Ward Bakery is still in the final stages of demolition, as the New York Times's correction yesterday stated; it was not completed in October, as I wrote Wednesday. 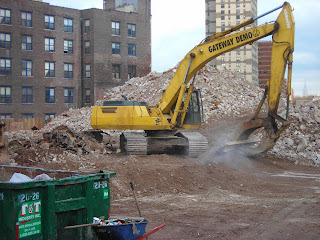 Also, the Times said demolition began in September 2007. Actually, Forest City Ratner announced it would begin in March 2007, and it did. 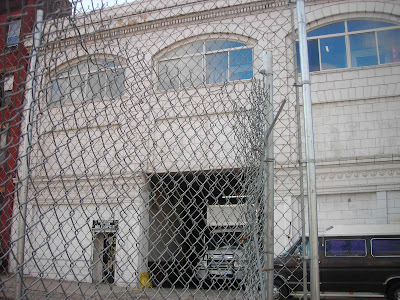 In fact, as the photo at right shows, there's a whole part of the building--at the eastern flank, along Pacific Street--that remains intact. It contains two parts: one, shrouded in scaffolding, is undergoing demolition, while the other still operates as Pack It Away Storage, in a structurally stable additional segment.